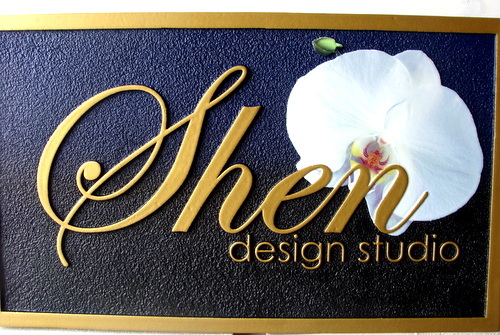 This elegant carved and sandblasted High-Density-Urethane Sign for the Shen Design Studio features the company's logo, the scripted name in gold and a Hibiscus blossom.The flower is painted on a flat surface with 1-Shot enamels , and it surrounded by a sandblasted sandstone texture background painted black. The raised text and border are painted metallic gold, and the entire sign is clear-coated teice. this 24 inch sign can be hung from a scroll bracket or mounted on a wall.